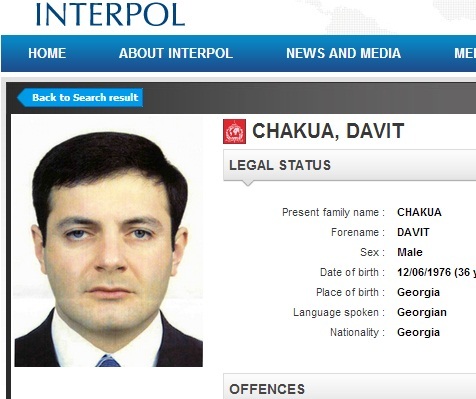 Interpol’s notice regarding Davit Chakua. TBILISI, DFWatch–Georgia asks for help from Interpol in its search for a former government official. This time, the wanted note is about Davit Chakua, the former head of the prison department, who is charged with abuse of powers, humiliating and inhumane treatment, provoking a crime, falsification of evidence and influencing a witness. Chakua is also implicated in other cases against former officials. According to the Prosecutor’s Office most recent accusations, the former justice minister Zurab Adeishvili, whose location remains unknown, instructed Chakua to make employees of Prison No 8 organize humiliation, verbal and physical abuse of certain targeted prisoners and film it, then hand the video to the media. This was part of a plan to hurt the Georgian Dream coalition, the Prosecutor’s Office claims. Georgia earlier asked Interpol for help in apprehending Adeishvili and a few Interior Ministry officials, one of whom was detained in Ukraine, but has not yet been extradited to Georgia. Adeishvili is rumored to be in Belgium.